Pomegranates are a traditional Mediterranean fruit, along with olives, grapes, figs, plums, dates, and apples (yes, plums and apples are traditional Mediterranean fruit). 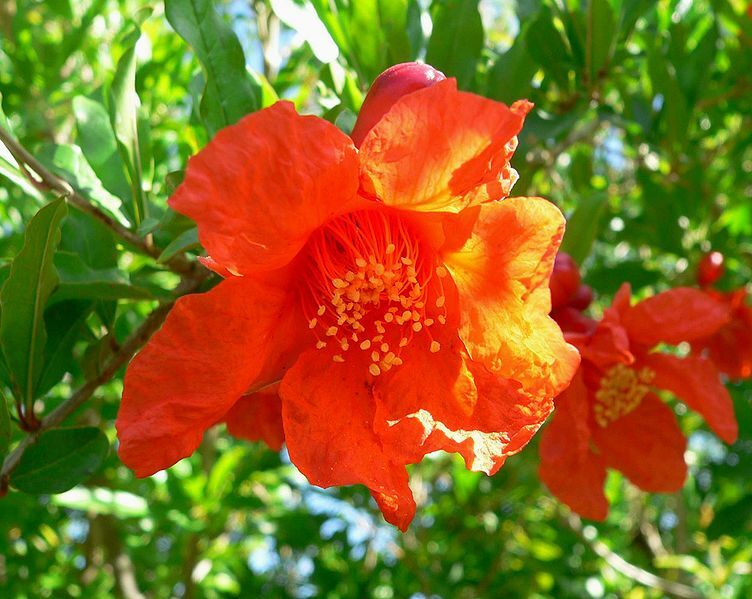 It’s an attractive, multi-stemmed shrub or small tree, growing to be 6 – 10 m tall, with glossy green leaves and brightly coloured flowers which can be quite showy in some varieties. The fruit are quite large, between an orange and a grapefruit in size, and coloured pink to orange when ripe. There are multiple cultivars with slightly different fruit characteristics. The seeds of the fruit are surrounded by individual ‘bubbles’ of red or pink, juicy pulp. Seeds are eaten whole, with the pulp. 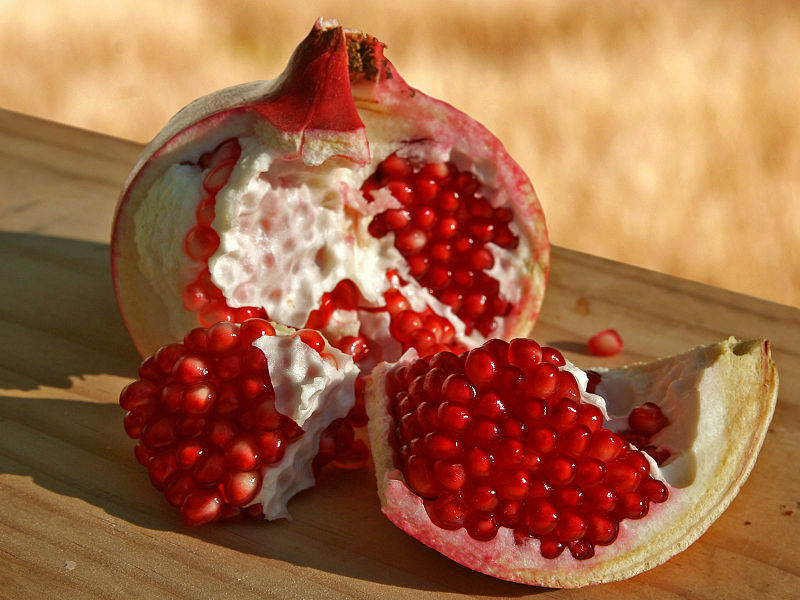 As well as being eaten fresh, pomegranates are often juiced to produce not only fruit juice but also various syrups (grenadine, pomegranate molasses), pomegranate wine, and vinegars. 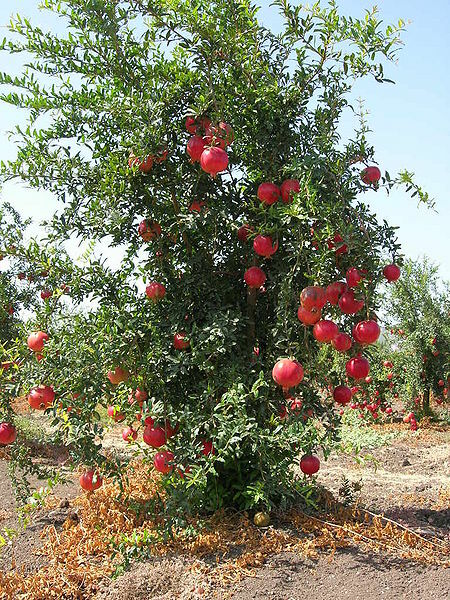 Pomegranates can be grown as single trees, as hedges, or even as bonsai. They are both self-pollinated and pollinated by insects, though cross pollination results in better fruit set. 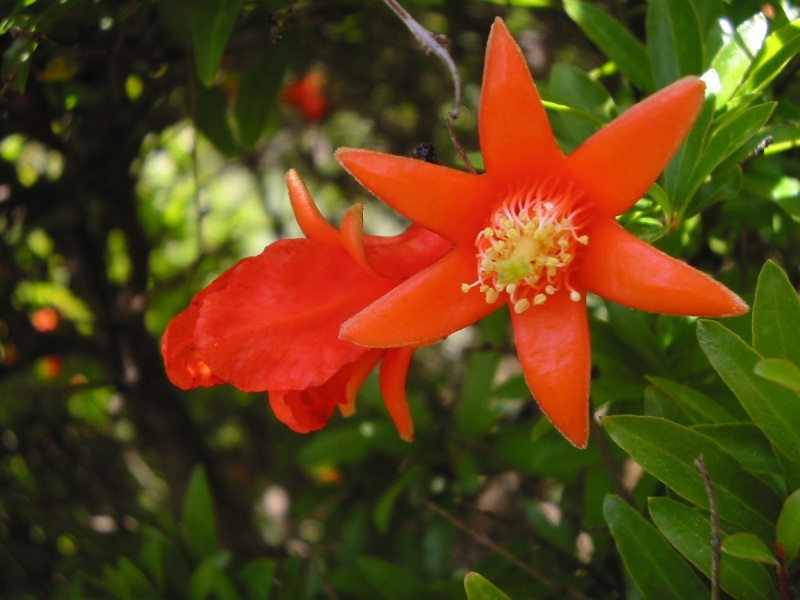 The seeds germinate readily, although most commercial propagation is by hardwood cuttings. We have two pomegranates planted so far, mainly because they are a traditional Mediterranean food plant and one of the objectives for Gallifrey Forest farm is to produce as wide a variety of climate-appropriate foods as possible (and economically plausible) on a small acreage. They’ve been in the ground for 3 years, but the location we chose for them originally wasn’t a good one – unlike many plants not native to Australia, when people say that pomegranates like full sun they mean even in summer in WA full sun. After three years of sickly baby trees which didn’t grow and had yellowish leaves most of the time in spite of all the soil amendment and fertilisation we could apply, I decided that they had to be moved. Within days of moving them to a new, sunnier location near the figs we’d just planted behind the workshop, they were growing new, bright green leaves and looking happy for the first time ever. The rabbits or kangaroos got to the new, bright green leaves and growing tips before we got to putting wire tree guards around them, but they are growing back and still looking happy. If I hadn’t seen them mooching along looking sick for so long I’d almost believe that pomegranates were one of the hardiest plants I’ve tried growing. Apparently part shade in the early morning and mid to late afternoon is way too much shade for happy pomegranates. Water – Not too much of this, but they do need watering. Like figs, they’re more delicate than you expect during their first year or so in the ground, and need regular water. Sunlight – All of it. Literally full sun all day. This is not an understorey plant. Soil – They seem to be happy with anything, but free draining is best. 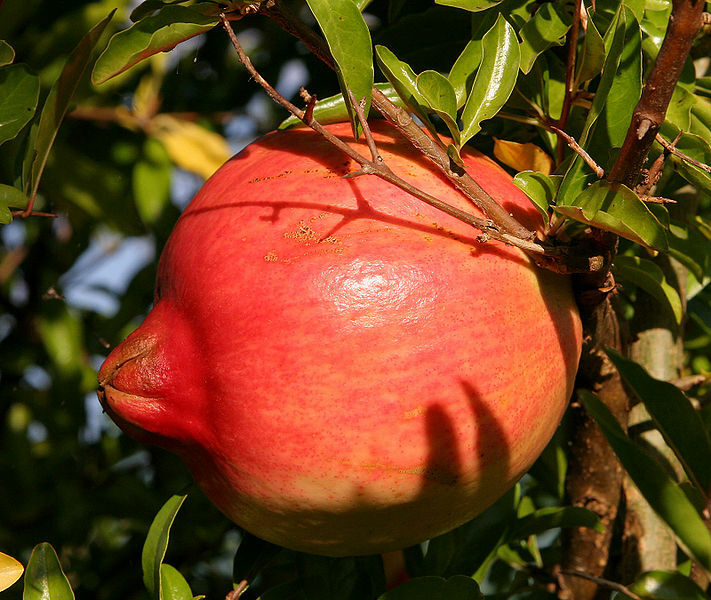 Space – Pomegranates are technically a large shrub, not a tree. They grow outwards as well as up, and they will turn into a spiny thicket if you don’t keep them pruned and trained. 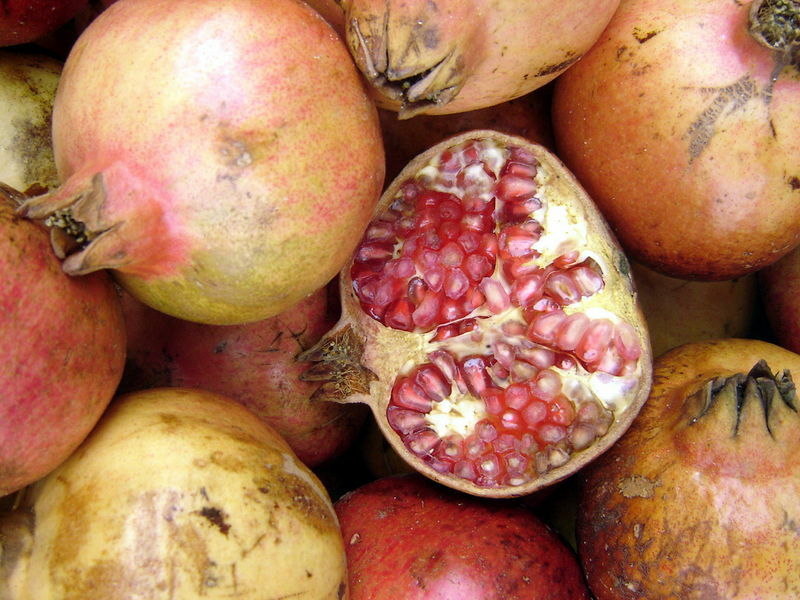 Warmth – Pomegranates don’t like frost, especially when young. But they can usually survive a light frost. Edible fruit, useful for juicing as well as eating fresh or making syrups and vinegars. There are lots of different varieties of pomegranate trees, which vary in the flavour and appearance of the fruit, but all varieties (even the ‘ornamental’ ones with tiny dwarf fruit) have delicious edible fruit. We have one ‘Wonderful‘ and one ‘Rosaveya‘ planted. Landscaping – these are tough, low-maintenance, pretty little trees. New plants, from seed or cuttings (hardwood cuttings 25 – 50 cm long, treated with rooting hormone).